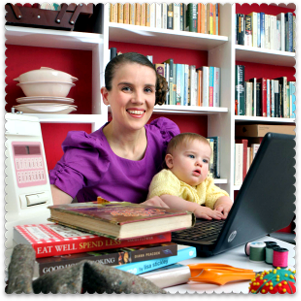 Here at Thrifty Towers we recently celebrated four years of wedded bliss. It feels like a lot longer than four years – is that a good thing or a bad thing? This year we wanted to go somewhere fun to mark the occasion. We have come a long way since our first wedding anniversary, which took place not long after we had returned to the UK with hollowed pockets. My mother-in-law gave us a £20 note and we went to Colchester Odeon to see a Jack Black film. In lieu of a proper dinner we went crazy for the pick-and-mix, and spent much of the film feeling queasy because we’d eaten too many sweets. 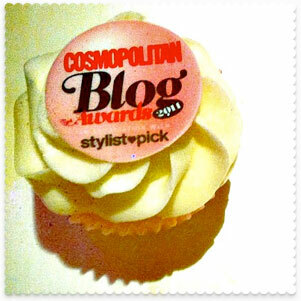 Yes: we were that classy. Who said romance was dead, eh? And this year? We made it to the Turkish Baths in Harrogate, which is not far from where we live in North Yorkshire. Baths aren’t obvious romantic settings – particularly when, as in this case, they are run by the local council – but these ones are something else. Harrogate is a Victorian spa town and Turkish Baths were common in that era. Today just seven of them remain; the lavish Baths at Harrogate have been painstakingly restored to their former beauty, but still feel like a well-kept secret. Hidden away in the underbelly of a large, Victorian baths building, they aren’t very large and so you have to book ahead. Terrazzo floors give way to walls of “vibrant glazed brickwork” and painted pillars, walls and ceilings. The washbasins are Thomas Crapper; the changing cubicles (above, in the background) are made from dark wood and sealed with heavy velvet curtains. When you visit you begin with the steam room and the cold plunge pool, before working your way up throught the three interconnecting Hot Room Chambers. There is the Tepidarium (warm), Calidarium (hot) and Laconium (hottest). You are recommended to spend at least an hour-and-a-half working your way through the Hot Room Chambers, with regular dunks in the plunge pool to cool off. Visits end with a “cool down” in the Frigidarium (relaxation room, above). We have both been pretty busy these past few months; what made Harrogate’s Turkish Baths such a great wedding anniversary destination was that we were in handsome surroundings, away from our laptops and mobile phones, and while we were there we couldn’t do anything but sit around and relax. We lounged around on the recliners and stone benches in the hot, hot rooms for a long time, just chatting and taking it easy. Afterwards, when we emerged into the 21st century again, we felt wonderful: restored, relaxed, exhilarated and erm, super-clean, all rolled together. The admission price? A modest £15 per person. So after all these years, I’m still a cheap date! I don’t think I’ll be going back to Colchester Odeon, but I like these unusual wedding anniversaries. Dinners for two are so… predictable. Votre blog est si riche d’informations … continuez votre bon travail!! 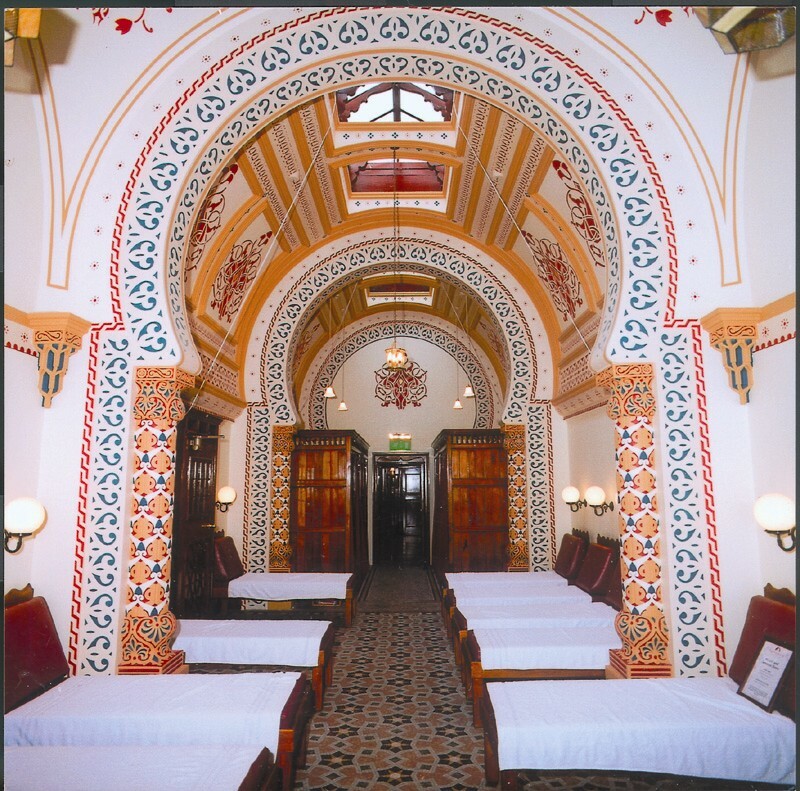 Thank you for sharing your experience in Harrogate Turkish Baths. I wish to go there this coming February. I had heard about the Turkish baths in Harrogate but I’ve never visited them. And, I have to admit (sorry) it’s not the first place that springs to mind for a wedding anniversary celebration. But the idea of shutting oneself away, free from modern day distractions does make me think it might be worth a try. 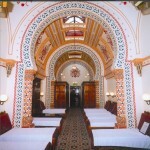 Normally Turkish baths have seperate rooms for men and women. How is this one in Harrogate? The baths have a variety of sessions: there are mixed sessions and ladies-only sessions. People tend to keep their swimming costumes on!